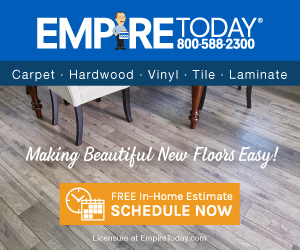 Empire Today claimed to be running a sale on flooring. Based on that claim, we asked a salesperson to visit us. They showed us attractive flooring samples but then said only two ugly types of flooring were on sale. The others, including the styles we liked, were full price. And, that full price was high. I thought that the way they presented the sale and actual cost was dishonest. However, we were in a hurry to finish the house and move in so we agreed to the price for the non-sale materials. We chose a laminate flooring with the higher quality pad. A crew visited and quickly installed 5 rooms with the flooring, pad and baseboards. They asked us to inspect the work and approve of it. Not knowing what errors to look for we walked through the house and the floor seemed okay. Later, the many errors became clear. The laminate was not run all the way to the walls but just close so that a baseboard might hide the gap. In many places that gap is visible and obvious. Quite a few sections of laminate were not seated well against the next piece so that after a little dust got on the floor there are obvious lines. A spot at one door has discoloration that looks like water damage. The worst is the pad. I don't know what is actually under the laminate but there is a difference in elevation in the laminate from one room to the rest of the house. It looks like the pad was not installed in that one room. And in several spots through the rest of the house the floor is spongy like the pad was left out of a two foot spot. Since the elevation of our concrete-slab floor is consistent throughout the house I believe the pad was not installed in one room. And, I believe the spongy spots are gaps in pad that was installed. In my opinion, the company tricked us with a promise of a sale to get our business. I think they grossly overcharged for the materials and installation. And I think the installation was not just poorly executed but done wrong. Review #500037 is a subjective opinion of User500037.